Pope Francis often speaks of what he calls a “culture of encounter.” During his visit to the United States, he hugged children and the elderly and warmly shook hands with everyone he met. The Holy Father was showing us what this culture of encounter looks like. Amazingly, we Little Sisters of the Poor received a very unforgettable lesson in encounter when the pope unexpectedly visited our home in Washington, D.C., on Sept. 23. At nearly the end of a long, eventful day, Pope Francis walked through the back door of our chapel. There he was, this international superstar, and we had him all to ourselves for the next 15 minutes! Before we knew it, he started greeting each of the 40 sisters with a smile and a firm handshake. Some of the sisters kissed his ring (a traditional sign of respect and faith in the pope as the successor of Peter), while others assured him of their prayers or spoke of their aspirations. Each one felt that she had been the object of our Holy Father’s undivided attention. When it was my turn, I thanked Pope Francis for speaking about the elderly and promoting their dignity and valuable role in society. He listened attentively and then looked straight at me, replying that yes, it is very important to speak about older persons. It was an unforgettable inspiring affirmation of our mission. For me, however, the most touching moment of the Holy Father’s visit happened a few minutes later. The pope came to one of our elderly Little Sisters who suffers from dementia. Sister is no longer able to speak and, as I knelt a few feet away ready to snap a photo, I didn’t think that she even made eye contact with him. But that didn’t matter! Our Holy Father leaned over her, took her hand in his and listened as our superior told him Sister’s name and a few details about her life. His gaze went from her hands to her face and back again, and then he traced the sign of the cross on her forehead before moving on. What struck me so deeply was that even though Sister was not able to communicate with him in any discernable way, Pope Francis gave her just as much attention as he gave the rest of us. That moment helped me to understand the culture of encounter as an acknowledgment of human dignity. God is mysteriously present in each and every person, and each of us manifests God’s love in a way no one else can. To encounter another person as our Holy Father does is to realize their inherent dignity and their unrepeatable uniqueness in God’s eyes; it is to believe that they have something unique to offer. Several weeks have passed and I still find myself pondering Pope Francis’ interaction with our elderly Little Sister. Just as his words to me affirmed the importance of our mission to the elderly, his attention to her underlined God’s unique and faithful love for each of us, regardless of our status in life. Pope Francis taught me that to encounter another person means to let God use me to communicate his love to him or her, to say, “You are important to me, I am counting on you.” Jesus says this to each one of us, no matter our vocation, and he wants to use us to communicate it to others. This is the culture of encounter! 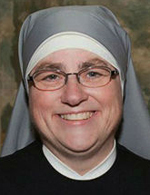 Sister Constance Veit is the communications director for the Little Sisters of the Poor in the United States. Your article touched my heart. Thank you!